Glitch description and how to replicate: Whenever I enter the swamp with both characters, the game kicks me out to the main DraStic screen. Entering as just the girl produces no problems. I have only tried this while playing as the girl - I do not know if the same would occur while play as the boy. Slot 1 and 4 (I believe) have a save state right next to the swamp entrance with both characters. Glitch description and how to replicate: visual glitch that occurs when entering a building or battle starting while in fast forward mode. First of all, I have no outlaw missions available on the boards (which is I had never seen before). I take more than one mission to complete from the other board, some of them take place at the same dungeon. This is where it gets odd: You accept multiple missions from the same dungeon and you proceed to complete them by the time you are done and you get the rewards from the mission your client may have no sprite and in the text window appear as another pokemon or the game freezes when you skip the text. It sometimes get the pokemon correctly and the sprite still be there but it ends up freezing anyways. The DraStic Menu keeps working but you get no response from the screen. Glitch description and how to replicate: There are multiple areas that crash the game when you get close to them and try to render them in the top room. Go upstairs and hold the L button to look left, and you will crash because you're next to an object that will crash the game when rendered close up. However, if you don't look left and you go up to the front of the ship and look back at the area that crashes the game when rendered, it doesn't crash because you're not close to it. Weird! I'm going to continue playing it and finding oddities like this. Glitch description and how to replicate: Trucks on the top screen still show up even when going back to the main menu. To reproduce this, start a new race, press Start to pause, then Select to go back to the menu. You should see the trucks from the race overlapping the logo. This is pretty much the exact same issue on Desmume and out of curiosity I decided to try it out on Drastic. Hi how i use (Hold R)? The bounding box around monsters and/or Issac, as well as the circle that appears when selecting monsters and/or Issac does not appear. This makes it very difficult to play as you don't know who is selected when moving. It's a guess but I believe this may be a layering issue. Glitch description and how to replicate: On certain occasions the green time and date bar on the top screen would appear garbled. 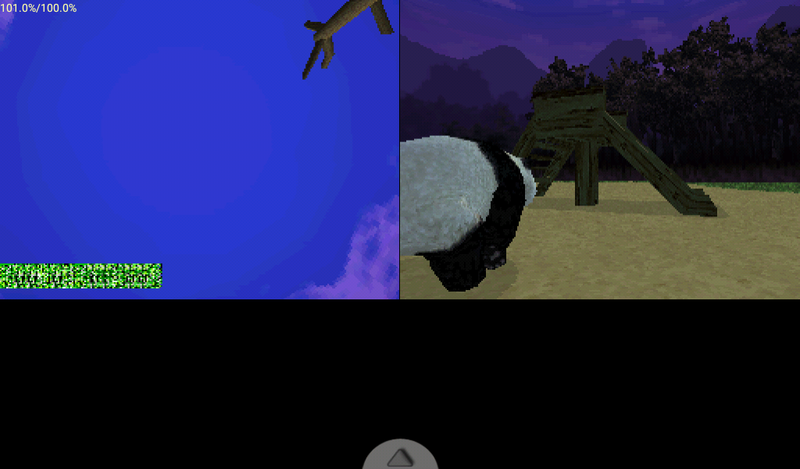 This shows up once you have named your first panda and completed the tutorial level.